Blank PCB only (unassembled). This is a breakout board developed for the Freescale MMA7660FC 3-axis G sensor ( accelerometer ) This board is setup to be used in a standard 0.1" breadboard or proto-board. * 0.1" spaced pins in a 2 row by 4 pin configuration , rows are spaced 0.6"
* Independent power for DVDD and AVDD with pads for 0.1uF 1206 bypass capacitors mounted directly below the IC. Grid style prototyping PCB. Great for use to prototype a circuit. We have used these boards for many quick projects. I have been really impressed with how well these hold up to soldering, unlike other prototyping boards I have used that only have pads on one side and peel if heated too long. Since these have plated through holes with annular rings on both sides they are easy to work with and the pads hold up well to soldering. It works standalone for small projects or as a module in larger projects. Pads on the edges are great for 0.1" pin headers or connectors. Blank PCB only (unassembled). This is a breakout board developed for the Austria Micro Systems AS5040 Rotary Encoder IC. This board is setup to be used in a standard 0.1" breadboard or proto-board. * 0.1" spaced pins in a 2 row by 6 pin configuration , rows are spaced 0.6"
The board can be mounted so that the IC faces the magnet or the bottom of the PCB faces the magnet. On sale now was $2.99 save 33% limited to current stock. 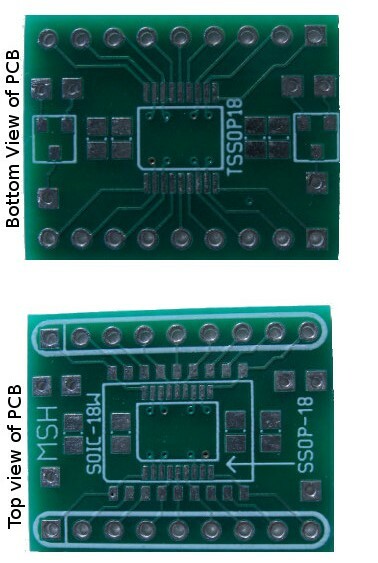 This breakout board handles SOIC wide, SSOP (3.9mm wide package, 0.635 lead pitch), and TSSOP (4.4mm wide package 0.65mm lead pitch) up to 18 pin ICs. 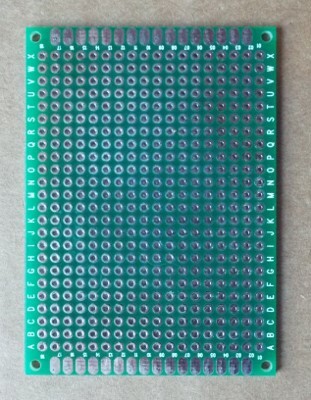 The board has standard 0.1" spaced pins for use in standard breadboards. The board has two SOT23 footprints, useful for if you want a small voltage regulator or FET on the protoboard. Also there are 0805 footprints on both sides of the board for power supply decoupling. The capacitors can be air wired to the required pins and meet manufacturer requirements for proximity of decoupling capacitor placement. Note: The edges of the boards are curved in the images from the Macro lens, the actual board edges are flat.